Previously, we gave you tips on setting up your email newsletter and what it should include. But what about the structure of your email newsletter? 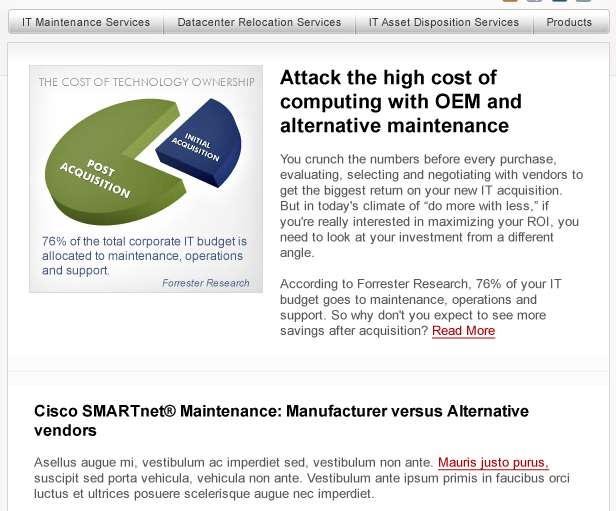 Is it a promotional newsletter showcasing new products or services? Is it an advertisement newsletter notifying your subscribers of a sale, promotion, or new deal? Is it an informational newsletter that educates your subscribers on your products and how to better use them? Once you know the answer to these questions, you can begin planning out your newsletter. The header of your email works just like the header of your website; it tells readers what they're looking at. It is important that your name and contact information (if you choose to include it there) is in text, so that if a reader has HTML / images turned off by default, they are not confused as to who sent the email. The header area should be kept clean and only used for your logo and branding, contact information, and possibly social media links. If you are sending out a product email, your products should be front and center. 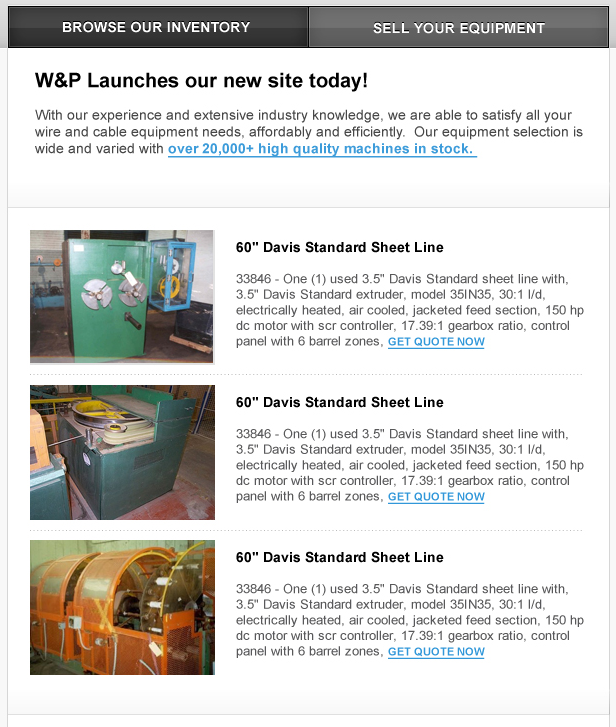 This mock up example from Wire and Plastic's (Left) product email has a brief news blurb at the top about their new site and then goes right into showcasing their refurbished machinery for sale with a photo, description, and link to get a quote. Short, sweet, and simple. And even if the recipient doesn't have HTML / images enabled, they still see the text description of the product and the link. If your email is designed to update your subscribers on a new article, that needs to take center stage. Always include a graphic to draw your reader in. As for body copy, some like to include the first few lines of the blog or article they are linking to as a preview. Others like to offer a summary and / or ask the readers questions to get their attention. This mock-up example from XS International (Right) has a compelling chart to accompany an introduction to an article. All emails need a call to action. Otherwise you're only acting as a pen pal with your email subscribers. And while that may be nice, it's not very nice to your bottom line. The main focus of your email should be the call to action. Whether you are promoting an article or special deal, the call to action is the reason for your email. However, you have plenty of room in your email to include other calls to action in the sidebar or below the main content area. In the example to the right, Rick Segel promotes his current webinar in his weekly email newsletter, which includes a logo, description, the time and date of the webinar, and a link to register. As often as you update the calls to action on your website, you should update the calls to action in your emails. Keep them current, and keep them fresh. When launching your email newsletter, you want to make sure that it is compatible with all major email clients, especially Outlook (doubly so if you are a B2B company). 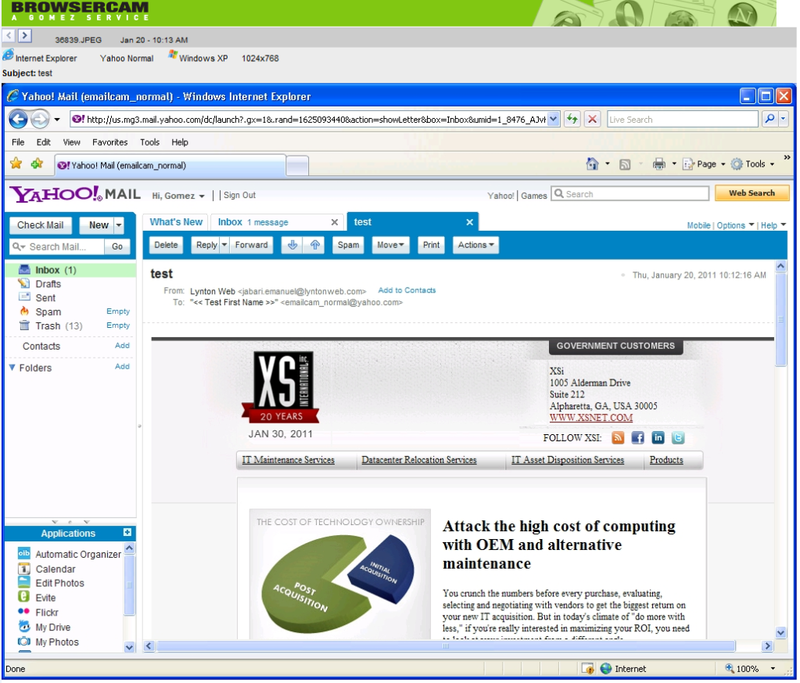 Services like BrowserCam will test Outlook (2003/2007, Express), Gmail, and Yahoo! Mail (even AOL for the die hard hold-outs!) and will give you a screen shot of what your email looks like in those applications. Make sure ALL images have proper ALT tags. This is important. 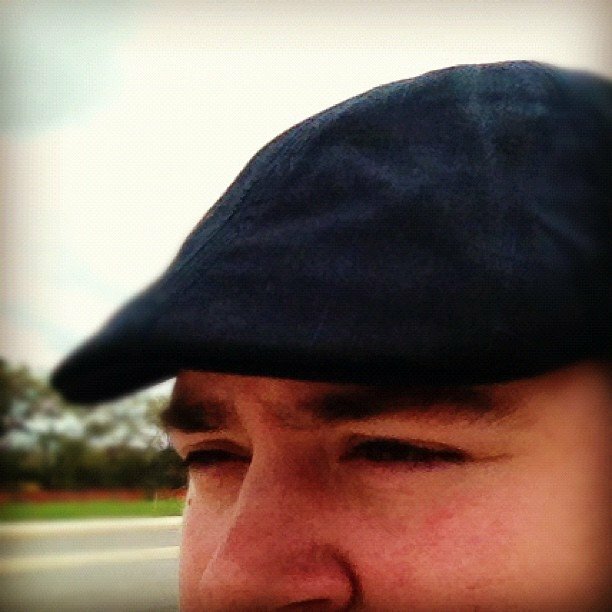 Even if a recipient doesn't have images / HTML enabled, ALT tags will help them see that they are missing content. It's obvious why this is important. If you are sending out an email to hundreds, or even thousands, of people, you are obviously linking them to an important page on your website. If your links are wrong, you cost yourself a tremendous amount of possible revenue and give yourself a big headache in the process. Have someone else test all of your links. We're all human, and we all make mistakes. It's easy to miss something, especially when you have been looking at the same project for days, even weeks. A fresh set of eyes makes the testing process more streamlined and efficient. Test all of your links ... again. Because ... we're all hmuan. With all these tips about structuring your email newsletters and communications, you are set to begin your email marketing campaigns, or better yet, contact an email marketing specialist at LyntonWeb for all of your email marketing needs!